Sprinkle flour on work surface; roll half of the dough 1/4 inch thick. Using 3-inch heart-shaped cookie cutter, cut 21 cookies from dough, rolling and re-rolling as necessary. Use remaining cookie dough to shape 7 stems for shamrocks. Bake 8 to 10 minutes or until light golden brown around edges. Cool 5 minutes on cookie sheet. Remove to cooling rack to cool completely, about 15 minutes. Microwave frosting uncovered on High about 15 seconds or until thin and easily spreadable. Tint with food color to desired shade of green. Spread frosting onto heart-shaped cookies. 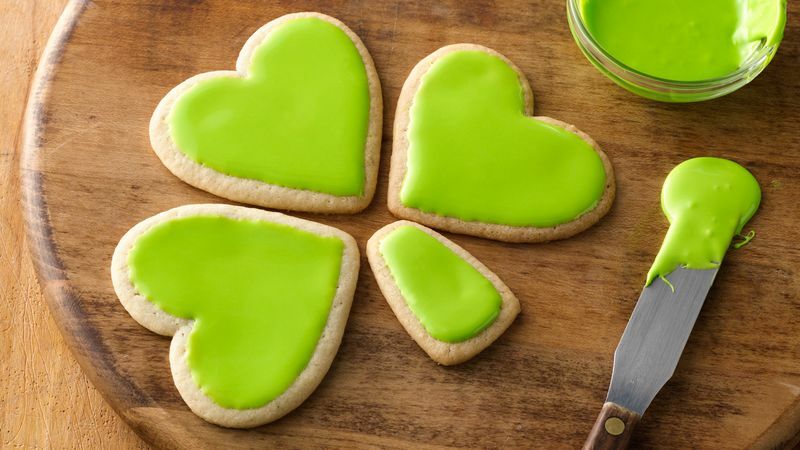 Arrange cookies in clusters of 3 to form shamrock shapes. Place 1 stem at the base of each shamrock.